Septapus is a bot which makes comics and charts, posts huge emoji's and sets reminders. All commands can be used in private messages without the @Septapus prefix. 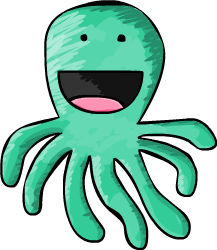 @Septapus avatar [@username] - Returns a big version of your avatar, or a users avatar if provided. @Septapus comic [1-10] - Creates a comic from recent messages, or a number of messages if provided. @Septapus customcomic [id:] <text> | [id:] <text> - Creates a custom comic. 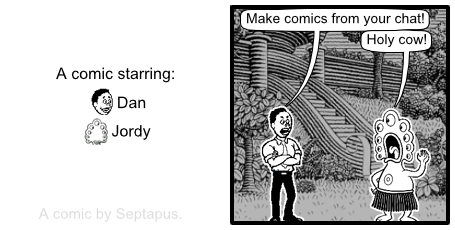 @Septapus customcomicsimple [id:] <text> | [id:] <text> - Creates a simple custom comic. @Septapus chart <up|down|flat> <vertical message>, <horizontal message> - Creates a chart trending in the desired direction. @Septapus emoji <emoji> - Returns a big version of an emoji. @Septapus hugemoji <emoji> - Returns a huge version of an emoji. @Septapus invite - Returns a URL to add Septapus to your server. @Septapus reminder <time> <reminder> - Sets a reminder that is sent after the provided time. @Septapus stats - Lists bot statistics. @Septapus wormhole <info|open|close|send <message>> - Send messages to other dimensions. I cannot thank the following people enough, thank you so much to all my patrons! Built with love by iopred.